Topic a lot, the nation’s largest scale of model hobby event “54th Shizuoka Hobby Show”. The exhibition in one fell swoop the new products to be released in the summer in the Tamiya booth. This time, new products of interest jostling with each genre! . You can see slowly and carefully the new product before the sale at the venue. Of course, also welcome questions and requests to explain staff! . Others, looking forward to shopping in uniform are a variety of products and goods “sales corner”. 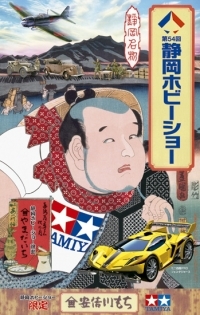 “The popular every year Tamiya open house “is also held at the same time. 2 days of doing hobby in the fresh green of Shizuoka, please come all together your family! Tamiya Booth new product of attention! masterpiece versatile twin-engine machine mosquito of the Royal Air Force, which was called an active part in every mission, “wonders of the wooden machine”. Fighter-bomber type is its flagship type, FB Mk.VI (6) is appeared in 1/32 scale of force. Accurately model the elegant outline on the basis of thorough actual coverage. Wing adopted the actual similar structure to be joined to the body the robust main girder parts by connecting the left and right to the nucleus. Tire is full of attractions such as the tread pattern and its own weight deformation is realistic in the molding in the clever parts division. ★ full width 515mm. ★ cockpit interior and lower torso of the bomb bay also dense finish. ★ 7.7mm machine gun and 20mm cannon also precisely reproduce the nose. ★ 500ポンドbombs and crew of dolls three bodies, with marking three. ※ The photograph is a real machine. It is different from the product specifications. biggest initial type of faces he Panther tanks tank battle in the “Battle of Kursk” in the first battle, D type is added to finally 1 / 35MM series. The only existing the vehicle carefully and interviewed, and modeled a complete new design a fearless figure with a tilt armor and powerful long-barreled 7.5cm gun in the Netherlands. Three detail up parts that complement the pivotal points effectively also appeared at the same time. Please check the origin of the masterpiece tank means. ★ Length: 254mm. ★ D-early also parts of smoke grenade launchers that can be seen in the. ★ track adopted a quick and realistic belt. ★ bust and the outside of the vehicle crew of doll one body of the commander, with decals three types of Kursk battle. ※ The photograph is an actual vehicle. It is different from the product specifications. was published in the “Colo Aniki” “Hyper Dash! Yonkuro” new car that appeared in the now also four wheel drive mini early. While leaving the image of the Dash No. 3 Shooting Star is a charming style features that have been configured with long thin canopy and complex rear of shape. Chassis is excellent in driving efficiency, has adopted the MA also can be easily assembled for easy maintenance integral structure. ★ to set the slick tire in the large-diameter four-spoke wheel of the white-collar. With marking sticker tighten the form ★. ★ with a double shaft motor. Gear ratio is 4: 1.
four AA batteries and the power source, all-in-one of the completed RC buggy is the new appearance. Brand New chassis buggy type of rear-wheel drive. 4-wheel strut suspension is a simple structure. The rear end it was equipped with a 370 type motor of easy to control characteristics. ESC and also unit with integrated receiver of 2.4GHz specification newly developed, can accommodate from 4.8V to 7.2V. ★ completed RC car of a full-length 282mm. The transmitter wheel type. ★ familiar Nezu Kota Mr. responsible for the design of polycarbonate body mini four-wheel drive. ★ steering servo using a 1/10 size. ※ The photograph is an image of being developed. It is different from the product specifications. and a top speed of growth, the TG10-Mk.2FZ chassis exhaust sound of the charm that plays a high tone, was a combination of the body of the original design . Body that combines the styling and aerodynamic effects, which become familiar Nezu Kota’s hand in the four wheel drive mini. The overall form that stance low to wide, sharp headlights create a fearless look, is before and after the fender features protruding. Overall length 430mm. 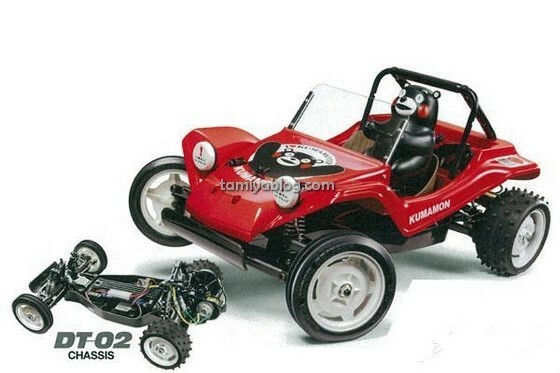 ★ duralumin Roi, with a Tamiya FS-12FZ engine and two-speed mission of the amount of exhaust 2.1cc a double deck frame of the resin upper to adopt the shaft 4WD chassis. is a Brand New models of compact M chassis size that adopts the shaft drive 4WD appeared. The main frame is divided into three parts monocoque, which is integrated to the gear box. Is placed next to the battery in the center of the vehicle body, it is equipped with a motor in the rear end. Double wishbone independent suspension, and fitted with a rally block tires for touring car. Body was chose Suzuki Shimuni (JB23 type). Overall length 347mm. ★ shaft 4WD chassis that ran enjoy it anywhere. ★ replace the central block of the frame, by combining the propeller shaft optional, three wheelbase are selectable. popular bear RC car 2nd buggy style topped Mon driver. I put the doll of “Kumamon” to the two-wheel drive buggy you do not choose a place to run from on-road to off-road. Rode in the driver’s seat and hold the handle doll of “Kumamon” is set in the pre-painted completed state. 380 types of motors tractable power characteristics which is mounted on the vehicle body rear portion. Body impact styrene resin that can be painted. ★ Length: 390mm. ★ Kumamon and tomatoes, such as watermelon illustrations, liven up the fun stickers also rich set. ★ You can also enjoy the built in performance up the optional parts sold separately. Self-Defense Forces vehicle is coming !! Only in a few opportunities Self-Defense Forces vehicle of force is the !! usually coming to the twin Messe Shizuoka to the eye, it does not miss this chance! We will deliver a Ustream live video from the venue! Simultaneous held Tamiya Open House! This entry was posted in Event Report, Future Releases on April 30, 2015 by admin. In our society, with the cooperation of the Corporation Tamiya like, we have been held using the 3D printer of the topic now to participate in parent and child in the country the work experience course to make the original body for the “mini four wheel drive”. It is active in the goal that will be held in Japan 47 prefectures all regions. We will come to your city! ! is to demonstrate the own way of imagination, 3D printer that can make what they want. From the era that were not used previously only part of the mania, it’s getting to the age that can be used by anyone. So, Kai to take advantage of our 3D data (3D-GAN) I was thinking. 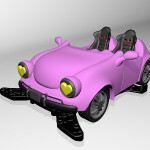 It dad from child, mother, or grandpa, that will make the opportunity to learn a fun 3D modeling together to grandma. ★ The 3D modeling their own way original body of parents and children the template to the original. ★ The first time any easy and fun, you can learn the manufacturing due to 3D. ★ It was run by assembling the original body to the actual mini four wheel drive, and enjoy. ★ Safe because it uses the PC and the 3D printer, not dirt, it smells also rarely. ★ It is currently the mainstream, making those with the 3D data is I can experience in half a day. ★ Also 3D printer also offers PC. Your participants are not particularly those get available. ★ We plan to hold in the region of everyone you live. Please see the Conference Schedule. This entry was posted in Customized Builds, Event Report on April 29, 2015 by admin. This entry was posted in Future Releases on April 27, 2015 by admin. This entry was posted in Future Releases on April 25, 2015 by admin. As written above these are unconfirmed rumors, final spec will be revealed in the Shizuoka Hobby Show in mid May. This entry was posted in Future Releases on April 24, 2015 by admin. This entry was posted in Future Releases on April 23, 2015 by admin. Super FM chassis that becomes the prize first appearance two-color fluorescent orange and white. I will expand in combination with the body four colors, including a clear system 2 colors. Also this time, special body Puromodera Hasegawa Shinji-san worked hits, offer gift planning even for a limited time. Come to this opportunity, please carry your feet to retailers! This entry was posted in Future Releases on April 22, 2015 by admin. Three wheel base further widen the play! Compact shaft drive 4WD model is new! Choosing a travel location in handy size “involuntarily want become Tsuredashi to play” has been developed on the concept of “MF-01X” chassis. The main frame is a monocoque structure that is integral to the gear box, and both light weight and high rigidity. The middle of the chassis of the horizontal battery, I’ve realized the shaft 4WD compact size in the rear motor layout. Equipped with tire of touring car size to 4-wheel double wishbone suspension, and finished in the “play” chassis you do not choose a place to run. Also, change the spacer is joint to the chassis, it is three wheelbase by combining shaft released simultaneously selectable. Compact and fit the chassis concept that can play tough, and chose “Suzuki Jimny” the body. Yet light car, and model the popularity of JB23 type to be full-fledged 4WD cross-country diversity to the base of the competition vehicle and customized car as vehicle. To “MF-01 X chassis” on compact M size, 1/10 in combination with the touring car the size of the rally block tires, perfect for the Jimny running around to healthy image. Even customize the vehicle as well machine to their liking good, also take out the leisure accompany good, it is one that easily can taste the fun of hobby RC car. ★ To transfer the motor power that was installed in the Riyaendo in front in the chassis side of the shaft. Simple main frame of the monocoque structure also an integrated gear box, I was also pursuing ease of assembly. 3 replace the mainframe central spacer block formed in a split, the wheelbase of the three by combining the different lengths of the simultaneous release shaft can be selected. You can also enjoy in combination with existing M chassis body. New materials of the industry’s first adoption change the run! Off-road racing user attention, appeared chassis kit “TRF211XM” which has made ​​the state-of-the-art evolution! With the aim of success in the future of off-road scene, and developed a machine that employs the industry’s first new material! ! Showed a runner results in recent memory in 2013 IFMAR off-road world championship “TRF201XMW”. we aim to flagship of a new off-road. off-road scene the high speed of the advance. Improvement of grip force will grip the maneuverability of the key. New materials of bathtub chassis that has been adopted aims to grip improvement achieved with no running feeling ever. Grip force and response force has been greatly increased by adopting the material of the chassis that combines the strength and elasticity. also active in the Tamiya off-road All Japan Championship Tamiya sponsored making it the promise can be one. Worked in various situations inevitable! ! High chassis capacity will demonstrate a wide range of adaptability! ! ★ New design Riyasutefuna battery Steph donor battery plate, brass (brass) is adopted suspension mounts & Cooling slipper plate. Parts involved in the chassis rigidity to suit the new chassis is the new design. And has adopted the new suspension mount to secure the grip. In addition, slipper plate has been designed aimed at cooling effect. ★ high strength, high elasticity and high impact resistance to the excellent new material “Quick Form (R)” adoption of the bathtub chassis! ! New of the new generation material “Quick Form (R)”. The material is that combines the benefits of metal and resin in high performance stampable sheet to balance the physical properties and moldability. Despite the material of high strength, is the material most suitable for off-road chassis also notable to say that super-lightweight. 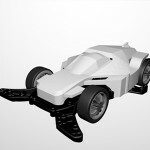 to exhibit excellent road surface follow-up in the race “TRF102 chassis kit” appeared! 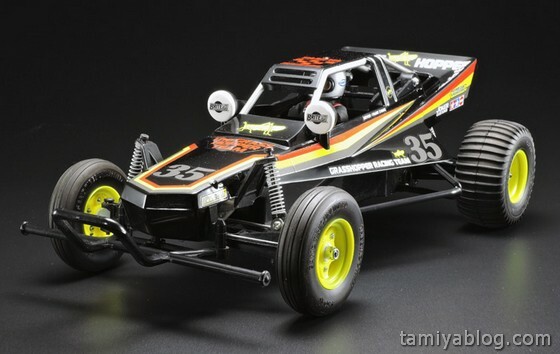 Tamiya Grand Prix, etc., in a variety of road conditions, it is 2WD Formula chassis has been developed so that it can be exhibited consistently high driving performance. And equipped with a roll point ball and pitching shaft, adopted the new T-bar-type rear suspension that the roll and pitch can be completely independently control each. I will deliver outstanding road surface follow-up. Furthermore traction battery floating mount fixed to 2.0mm thick carbon upper deck. I pull out the center on both sides cut of 2.5mm thick carbon Lower deck put the bending to the maximum. ★ Front pointed to King pin coil spring independent of the left and right. 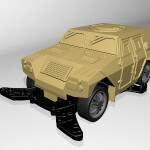 By making the reinforcing type suspension arms, and has a balance that can be used more bending of the entire chassis. Steering servo uses a new type aluminum servo mount and carbon steel bridge that is lighter, securely fixed by screws. Furthermore servo mount was optimizing the mounting rigidity of the chassis. ★ In order to maximize the bending of carbon Lower deck, adopted a floating mount to fix the traction battery to carbon upper deck. And to achieve a substantial suspension stroke up, creating a handling a sense of stability in smooth. In addition, expanding the mechanical mounting space compared to TRF101. I have increased the degree of freedom of choice and layout of electrical equipment. ★ Adopt new T-bar-type rear suspension that provides a complete independent control of pitch and control. Roll point ball is set to chassis limit low position, and maximize the roll moment. Furthermore pitching shaft is completely self-contained, I have to ensure a smooth moving to the road surface gap. In addition, the new motor mount was made ​​possible to adjust the mounting position of the rear wing. This entry was posted in Future Releases on April 20, 2015 by admin. The XB Version will be in the colours red, black, green and yellow. This entry was posted in Future Releases on April 17, 2015 by admin.